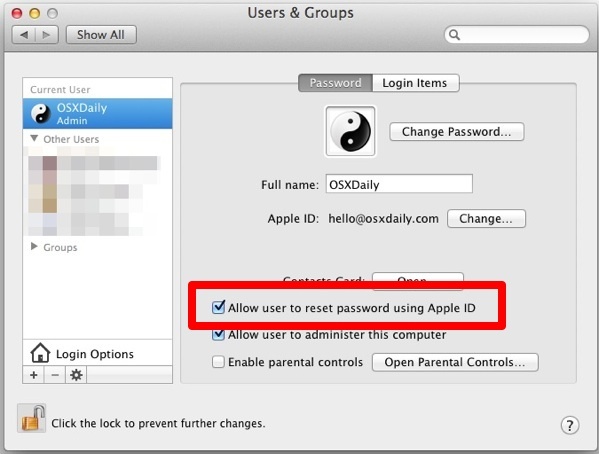 Many Mac users overlook a feature in OS X that allows them to attach an Apple ID to their actual user account, not just to iCloud and the App Store. It only takes a moment to set, and it provides for an incredibly simple password recovery option at the login and boot menus, allowing you to regain access to your user account and files just by entering the associated Apple ID. Going further, Macs with multiple user accounts can assign different Apple ID’s to each unique user account, or you can just choose to tie a single Apple ID to the Mac. 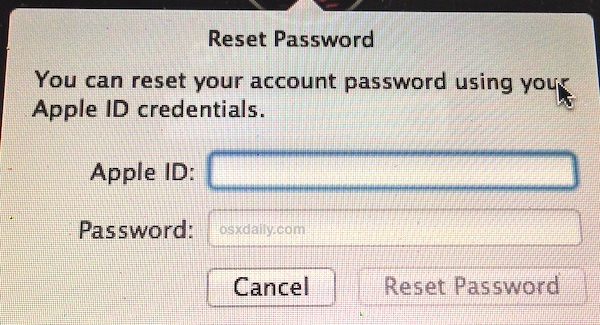 If you do choose to attach a lone Apple ID to the Mac this way, be sure to associate it with an administrator (admin) account in OS X, that way you will be able to regain full system access in the event it’s needed because the primary password has been lost. * If you somehow don’t have an Apple ID yet, you can set one up easily by clicking the “Create Apple ID” button. Apple ID’s are now tied to just about everything, from iCloud backups and access, to App Store downloads and purchases, to iTunes and the iBookstore, so if you somehow haven’t created one yet, do that now. This is extraordinarily quick and quite simple for Mac users running Mavericks, Mountain Lion, and Lion, and it prevents the need of the more technical approaches to resetting forgotten passwords (though those will continue to work as well). This works in OS X Mavericks, OS X Mountain Lion, and OS X Lion, the only requirement is having an active Apple ID. You will obviously need internet access to use this feature as well, since it requires the communication between Apple and the Mac to set the ID and also to be able to access the recovery benefits it offers.